For those of you who have decided to build a timber frame home, you have chosen a building style that has been rooted in tradition for centuries. While raising traditions differ slightly in definition and regularity depending on region, the history and legacy of timber framing is a common thread that ties these traditions together and creates an exciting and memorable event for those in the process of building their dream home. If you have gone through our photos, you may have come across a picture or two of a tree mounted to a timber frame and have wondered just what exactly was going on. Well, the explanation for this is what is called a Topping Out ceremony. 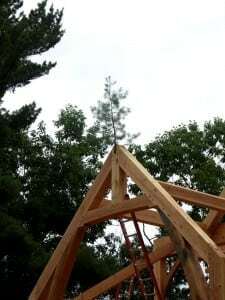 This is the most popular ceremony used in the timber frame building process where a bough or small tree is placed at the highest point of the home. The Scandinavian’s used to place a pine bough at the highest point of timber frames to bring good fortune to the land and the home. This tradition was carried over from European settlers to North America where it has been adopted and adapted. Another connection to this tradition came from Mohawk Indian iron workers who placed a small tree at the top of sky rises in metropolis areas because they believed that no building should be higher than a tree. This tradition is carried on still today by workers in some parts of the country. 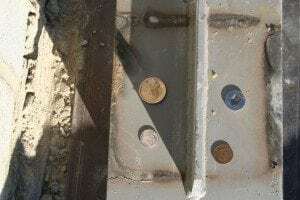 Another age-old tradition is the placing of coins under timber posts in the home’s frame. This ceremony mimics an old maritime tradition called “stepping the mast,” which is meant to bring good luck and fruition to the home. Traditionally, silver dollars are placed under the posts, however, the use of coins originating from one’s homeland or coins minted in a specific year are also very common. Gathering family and loved ones together to sign the wooden pegs that connect the timber framing is another tradition observed by some homeowners. Wishes of well-being and good fortune are written on the last pegs and the homeowner is given the honors of driving them in to secure the blessings on their home. The building of your own timber frame home is a once in a lifetime experience, and there are several traditions that you can choose to participate in as we raise your timber frame. Whether you choose to take part in one of these traditions or make your own, your home’s traditional building style and perfectly tailored design will be a legacy that you can pass on for generations to come.